A committee can receive bitcoins as contributions. 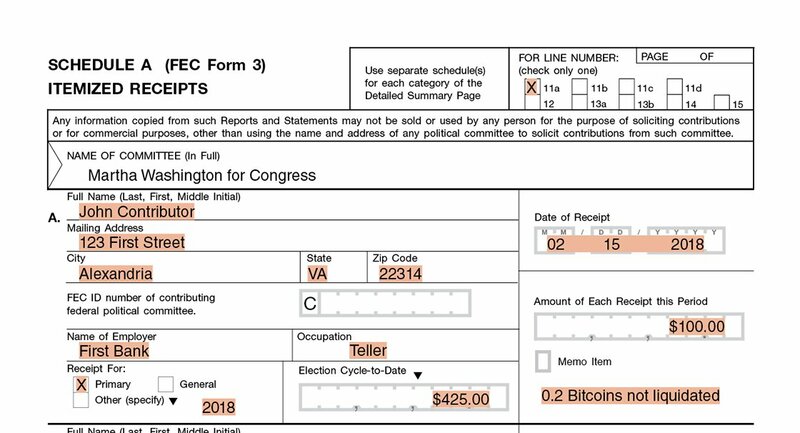 The Act defines a “contribution” to include “any gift, subscription, loan, advance, or deposit of money or anything of value made by any person for the purpose of influencing any election for Federal office.” In Advisory Opinion 2014-02, the Commission concluded that bitcoins are "money or anything of value" within the meaning of the Act. Bitcoins may be received into and held in a bitcoin wallet until the committee liquidates them. Holding bitcoins in a bitcoin wallet does not relieve the committee of its obligations to return or refund a bitcoin contribution that is from a prohibited source, exceeds the contributor's contribution limit, or is otherwise not legal. A political committee that receives a contribution in bitcoins should value that contribution based on the market value of bitcoins at the time the contribution is received. House and Senate committees report receiving bitcoin contributions on Form 3 and itemized on Schedule A when necessary. The line number used to report a bitcoin contribution depends on who is giving the contribution. Use Line 11(a) if the contribution is from an individual, Line 11(b) if it comes from a party committee, and Line 11(c) if it comes from another type of political committee, such as a political action committee (PAC). The initial receipt of bitcoins as contributions should be reported like in-kind contributions. The committee will disclose the receipt of the contribution and also report the bitcoins as a disbursement. These offsetting entries allow the committee's reported cash-on-hand to remain unchanged while holding the bitcoins outside of a campaign depository. It is recommended to include a notation or memo text indicating the number of bitcoins that the committee received and that the bitcoins were not liquidated. John Contributor gives the committee 0.2 bitcoins, valued at $100. The committee itemizes this contribution on Schedule A, supporting Line 11(a)(i). It includes the contributor’s mailing address, employer and occupation. 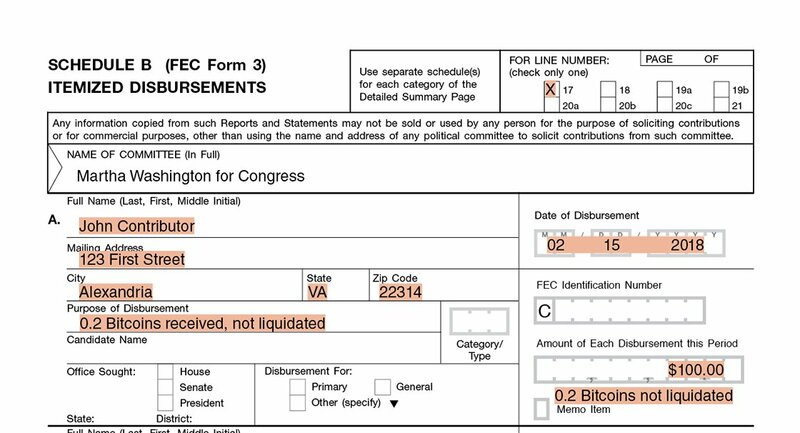 It also reports details about the bitcoin contribution, including its value, the date it was given, election designation, and aggregate election cycle-to-date total for John. The committee also includes a notation that 0.2 bitcoins were given and that the committee has not liquidated the bitcoins. Any usual and nominal fees that the processor charges should not be deducted from the reported value of the contribution. The committee should report the usual and nominal fees and commissions that it pays to an online processor as an operating expenditure. On the Summary Page tab, right click on the contributor’s category and select “new.” Enter the contributor’s information and check the “in-kind” box. This will ensure that the contribution is on both Schedule A and B. In the description field, “In-kind:” will be added automatically. Add a description of the in-kind received.